Enjoy Complimentary Tram Services from select hotels below. The tram runs from 11:00 a.m. to 10:30 p.m. Monday through Friday, and until 12:30 a.m. on Saturday and Sunday nights. The tram runs seven days a week, from 8 a.m. to 4 a.m. Headed to T-Mobile Arena? We’ll get you there. Traffic is Beneath You! Exit the main lobby doors of Park MGM and cross the street into Toshiba Plaza. Exit New York-New York into The Park and walk toward Toshiba Plaza. Click here to access maps and directions. Walk/Tram option takes approximately 25 minutes. Walk to the Tram at the rear of Bellagio; Take the Tram to Park MGM station. Exit through the casino and cross Park Avenue to T-Mobile Arena. Walk/Tram takes 20+ Minutes and is a great alternative to heavy traffic in a Taxi or RideShare option. Walk along Las Vegas Blvd and turn Right on to Park Ave. Walk through Aria towards Self Park and continue through the corridor to Park MGM. Walk towards Self Park and continue through Park MGM. Take the Excalibur Bridge to NY-NY and continue through NY-NY following signs towards The Park and T-Mobile Arena. Walk along Tropicana to cross at Las Vegas Blvd. Follow Las Vegas Blvd to Park Avenue. The Park and T-Mobile Arena are visible from the top of Park Avenue. Walk through the casino, across the NY-NY pedestrian bridge and follow signs to The Park and T-Mobile Arena. Walk through Crystals to the Tram, or to Aria Self Park/Park MGM. Walk on Las Vegas Blvd South to Park Avenue. Walk along Tropicana to cross at Las Vegas Blvd, turn on Park Avenue to access The Park and T-Mobile Arena. Walk on Las Vegas Blvd South to Park Avenue to access The Park and T-Mobile Arena. Ride Monorail to MGM Grand station. Walk through the casino and across the NY-NY pedestrian bridge. Follow the signs to The Park and T-Mobile Arena. Take Harmon to Las Vegas Blvd and follow to Park Avenue entrance to The Park and T-Mobile Arena. Take the Excalibur Bridge to NY-NY and follow signage to The Park and T-Mobile Arena. 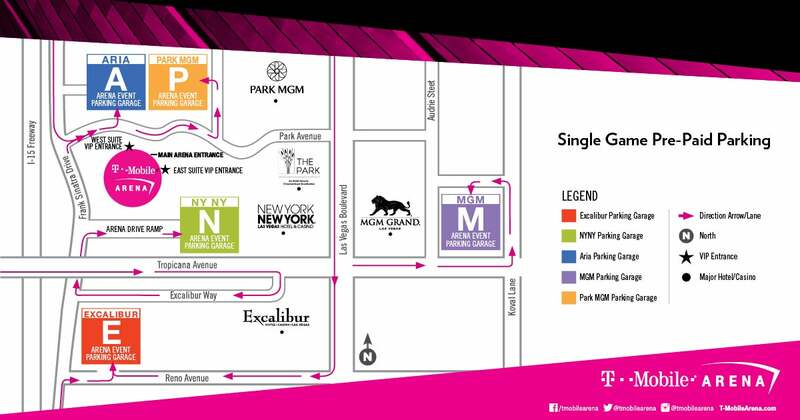 Walk along Las Vegas Blvd to Park Avenue to access The Park and T-Moblie Arena. Walk to Monorail and ride to MGM Grand station. Walk through casino and across NY-NY pedestrian bridge. Walk to Bellagio to access the Tram. Ride to Park MGM station. Walk through casino and across Park Avenue to access The Park and T-Mobile Arena.